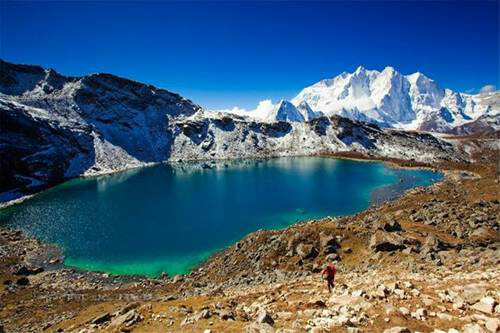 Trek to The Paradise Region near Everest, Enrich and improve Yourself! 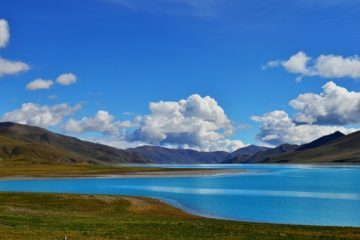 Explore Tibetan landscapes! You will be welcomed by our local tour guide and driver at Lhasa Gonggar airport or Lhasa train station. After transferring you to the hotel, our tour guide or trip advisor will have a brief talk with you about the service details and itineraries in the following days. After that, you can have a good rest in the hotel. Our tour guide will recommend some local restaurants and you can have a try for dinner. Remember to take enough water and sleep well for the acclimation to plateau environment. If you have Mountain Sickness, our local tour guide will accompany you to buy some AMS medicines. This day is prepared for you to be well acclimatized to the plateau climate. You have the full day exploring the city of Lhasa, just wandering on the old streets will give you unprecedented new experience about Tibetan people’s life. There are many restaurants and local stores where you can spend some time. For people who are interested in Buddhism, you can visit some monasteries and know more about Tibetan Buddhism from local pilgrims. On this day, we will plan a highlight day-tour for you to visit three must-see attractions in Lhasa, including Potala Palace, Jokhang Temple and Barkhor Street. In the morning, we will start the tour by visiting Potala Palace, the highest palace in the world. You will have around one hour to enjoy the marvelous Buddhism frescoes, religious artifacts, statues, and paintings inside the palace. After that, we will go to Jokhang temple, the most significant Buddhist temple in Tibet. Built by King Songtsen Gampo, Jokhang Temple has a very long history and there are thousands of Tibetan people pilgrimaging in front of Jokhang Temple. Around Jokhang Temple is Barkhor Street, where you can find local characteristic artifacts and religious objects sold by stores and vendors. On this day we will drive to Shigatse, the second largest city in Tibet from Lhasa. The total distance is about 280km. Due to the limit of speed, we have to drive for 5-6 hours. When arriving at Shigatse, our tour guide will help you to apply for the Alien’s Travel Permit (ATP) from Public Security Bureau (PSB). During this time, you can have a good rest. If you want, after the lunch, you can visit Tashilhunpo Monastery, which is close to the city. Others do not want to go there can have some leisure time in the city. As the second largest city in Tibet, Shigatse also have many restaurants with various tastes, such as Han, Tibetan, Indian, Nepalese cuisine. You can also buy some energetic food for trekking in the following days. Today we will leave Shigatse and go for Kharta, also known as Qudang Town in Chinese. Kharta belongs to Tingri County and was built in 1961. Mt. Everest, Lhotse and Makalu are located in it. G318 National Highway goes throughout the town, so it has an important geographic location. We will have lunch in Segar or Zhaxizong before arriving at Kharta. In Kharta, you can take beautiful photos of amazingly high mountains, Mt. Everest, Lhatso and Makalu. You can also have a birdview of world class mountain road here. After arriving at Kharta, We will continue to driving until Dampu for today’s camping. The total distance from Shigatse to Dampu is 370km and we will drive for about 8-10 hours’ to get there. Today we will start our trekking from Dampu to Shawu Tso for about 4-5 hours. The trekking distance is around 10km. The ascending slope is gentle, so you can have time to get used to it. There are some beautiful villages along the road and you can have view them closely. We will have lunch at a flexible time according to your request. Our mountain cook will prepare stewed beef and vegetables for your lunch. After that, you can have some fruits to add vitamins. Shawu Tso will be the destination for today and we will camp there. 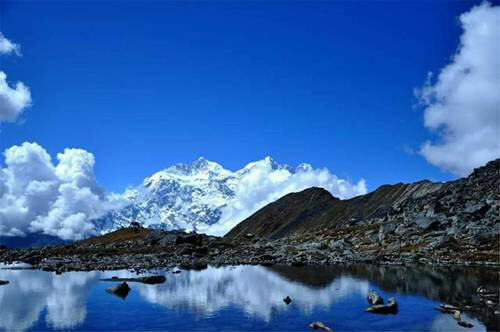 You can view Makalu and Chomo Lonzo if the weather is good. There are other lakes around so you can explore more if you want. Today we will start our trekking from Shawu Tso to Joksham. Along the way, we will pass Shawu La pass (5,030m). When climbing the pass, it will be a bit strenuous but we can have a rest at any time if you want. There are two climbing periods before arriving at Shawu La pass. During the first period, you can have a birdview of Shawu Tso and the second period will be much easier than the first one. There are fluttering prayer flags at Shawu La pass. Shawu La pass also is the ideal location to view Mt. Everest, Lhatso and Markalu. Then we will go down the mountain. You should be very careful when descending because it is a steep slope. If the weather is good, you can see a valley full of bushes, trees, and flowers. There is a stream when we reach the foot of the mountain. Ahead of the stream is a vast of forest but we still need to go further until reaching our destination for today, Jokshsam. The total trekking distance is 12 km for about 7 hours. It is a long day trek so please eat well and have a good rest at night. We will climb steeply from Joksham to Thangsum campsite. Along the way, we will pass a big forest growing birches, junipers, and rhododendron. At the end of the forest, we can see Kaamo Tsangpo Valley and take great photos on the ridge. Then we continue our trekking to Sharlung Pasture. In August, there will be flowers everywhere. You need to be careful because it is slippery when crossing the river. After crossing the river, we will have a steep climbing to Thangsum campsite. Then we have a rest there. It is a relatively short day so you can explore around the campsite in the afternoon. At Thangsum sightseeing platform, you can see Mt. Everest, Lhotse and Markalu from a very excellent angle. This may be the spectacular sightseeing platform in the world. Today is the 4th of our trekking so you may feel a little tired. But we need to continue our trekking and we will go through the famous Kaamo Tsangpo Valley where is definitely worth visiting. As the only valley near Mt. 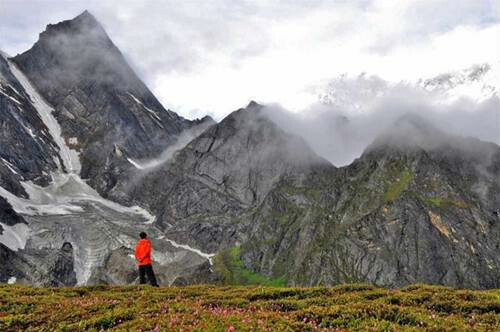 Everest has no road in, Kaamo Tsangpo Valley is kind of isolated and maintain the primitive ecological system. The Britain explorer Mr. Barley spoke highly of Kaamo Tsangpo Valley as the most beautiful valley in the world in this book Mt. Everest Investigation. We will take a descending road before arriving the valley. The road is steep so you need to keep watching of your steps. There is a river at the bottom of the valley. After crossing the river, we go up in a gentle slope. For about two hours’ walk, we will arrive Pethang campsite. Along the road, we can see Markalu all the time and the valley is surrounded by the snow-capped mountain. On the river banks stand various kinds of trees, which beautifully decorate the valley. Today will be very tough because we need to go through a landslide area which challenges a lot. The rocky trail is very long and steep. You should be very careful about your steps and keep safe all the way. Our tour guide will remind you constantly about your safety. When crossing the scree slope, we can take a close of Markalu, which is only 10km from the road. Pethang Ringmo is a huge meadow which is the final destination of today. 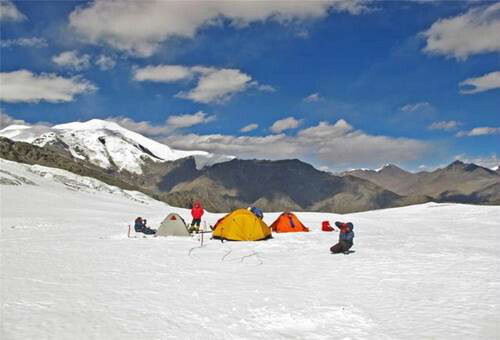 We will camp there and you can enjoy the panorama view with Kangshung Valley Glacier. This campsite was once George Mallory’s Base Camp and also the campsite for the 1921 Reconnaissance Team. This trekking day is not easy because only few of mountain climbers have been there. After Pethang Ringmo, there is a scree slope and you need to stay on the right track because there are many branches and people can easily get lost. We will arrive at the morainic lake and that is the key point. You can see the whole glacier aside with a wide perspective. 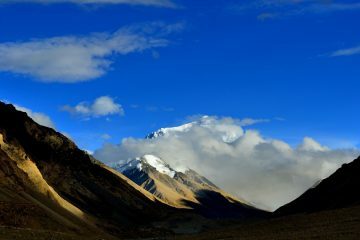 When you reach the Kangshuang Base Camp, you can see the fantastic view of Mt. Everest. The whole trekking progress is tough but when you reach, you will feel very accomplished. After viewing Mt. 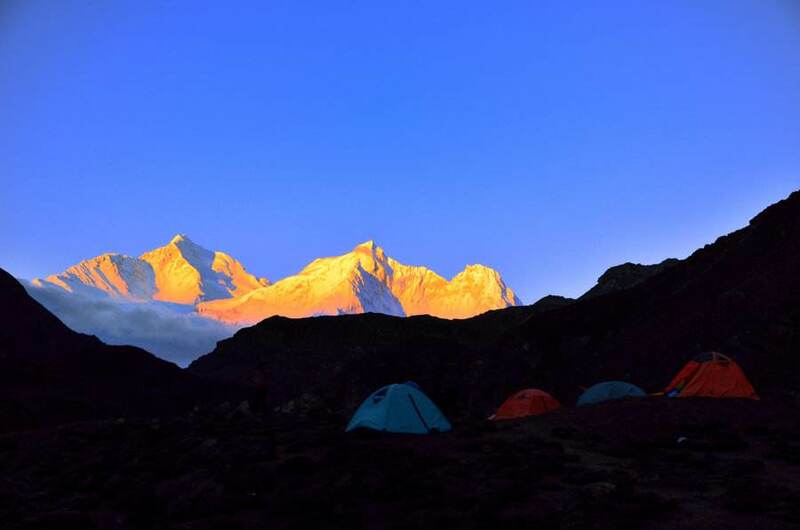 Everest and Lhotse in the base camp, we will go back to Pethang Ringmo and camp there at night. Today we will head to Rabgachu from Pethang Ringmo for 4-5 hours trek. We will go descending to Kaamo Tsangpo Valley at first. Along the way, we can enjoy the glaciers, forest and stream. The road can be slippery when crossing the river so you should watch the steps. After lunch we continuing trekking until reach Rabgachu, our destination for today. Tomorrow we will go to Tsoshutima, where you can have a wonderful view of all mountain peaks. Today we continue our trekking until we reach Tsoshutima, a famous sightseeing site for all mountain peaks view including Mt. Everest, Lhotse and Markalu. We need about 5-6 hours to get there. The ascending road take patience and perseverance. There is a scree slope and many branches along the way. So you need be careful and keep the right track always. But the fantastic view of all mountain peaks is definitely worth all effort to climb there. We will camp at Tsoshutima and enjoy the beautiful night views. You can take some photos at night for the starring sky. 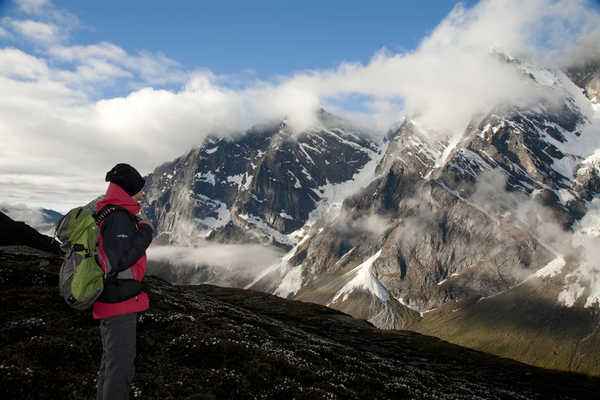 Today we will go to the North EBC to have a different view from the north side of Mt. Everest. Starting from Tsoshutima, we will ascend to Langma la pass, which is the highest pass. There will be three climbing periods. The first one is steep but you can look back to Tsoshutima surrounded by four plateau lakes when reaching the platform. There are fluttering prayer flags in Langma la pass. It may be snowing there. From there, you can see five plateau lakes with different colors. Then we descend for about 1,500m. The way is long and you will meet a narrow plateau lake called Lhaze Tso. Continue going down and we will arrive at the bottom of the valley. Then we will reach a small village called Lhundrobling. From there, we will drive to Rongbuk Monastery passing by Kharta and Zhaxizong. 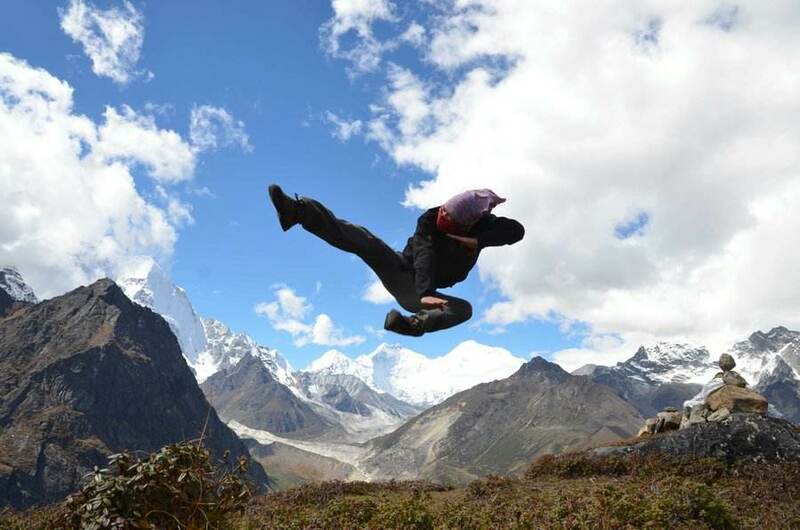 From Rongbuk Monastery, you can trek to Campsite and North Everest Base Camp. Starting from the Campsite, you can trek 4 km to EBC for closer look at Mt. Everest. With the sunrise, Mt. 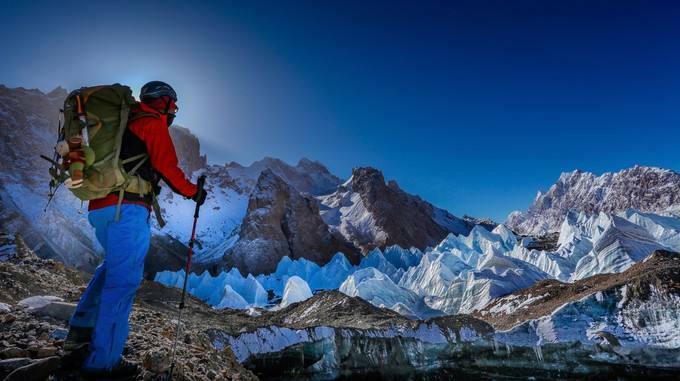 Everest will definitely leave you a deep impression. You can take more photos and leave after that. We will drive back to Shigatse after the long Mt. 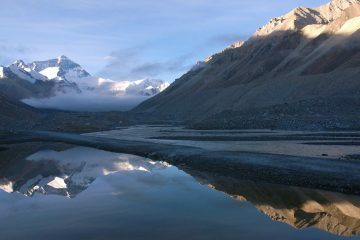 Everest trekking tour. In Shigatse, you can have a good rest and compile all the photos taken during the trekking. It is time to go back to Lhasa. After a good breakfast, we will start the drive from Shigatse to Lhasa. The distance is 280km and it will take us about 5-6 hours to get to Lhasa. At Lhasa, you have free time to spend the last hours in Tibet and enjoy the final moments there. After the long trek tours, it is time to leave Tibet. Our local tour guide and driver will transfer you to the airport or train station to say goodbye. Hope you have a great memory with us and welcome back to Tibet again!